Nana Akufo-Addo was sworn in as Ghana’s new president on Saturday, promising to stamp out government corruption and kickstart the private sector. 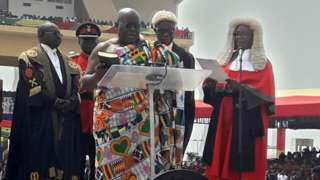 The 72-year-old former human rights lawyer took the oath of office at a ceremony in Independence Square in the capital Accra in front of more than 6,000 guests and a roaring crowd. Wearing a traditional robe draped over one shoulder, Akufo-Addo waved a gold sword — a symbol of Ghana’s presidency — before giving his inaugural address as head of state. “We no longer have any excuses for being poor,” Akufo-Addo said. “We must restore integrity in public life. State coffers are not spoils for the party that wins an election, but resources for the country’s social and economic development,” Akufo-Addo said. The new president underlined his campaign promise to support entrepreneurs and attract investors to the country, which has suffered from lacklustre growth in recent years. Eleven African heads of state attended the ceremony, as well as the outgoing president John Dramani Mahama, and former leaders John Rawlings and John Kufuor. Accra police enforced tight security during the inauguration, with major roads in and around the venue cordoned off. Traders set up stalls nearby hoping to cash in on the ceremony by selling Ghana flags and white, red and blue paraphernalia from Akufo-Addo’s New Patriotic Party. Akufo-Addo’s electoral victory — and the peaceful transition of power — cemented Ghana’s position as a beacon of stability in an often turbulent region. – ‘Gold standard for democracy’ – One international observer described the West African country as a “gold standard for democracy in Africa”. The new president told AFP that after smooth handovers of power in his home country and places such as Nigeria, leaders wanting to stay in office at all costs were “fighting the tide of history”. In Nigeria — known for contested elections and their violent aftermath — Goodluck Jonathan made an unprecedented concession to Muhammadu Buhari in 2015. But in the week of Akufo-Addo’s election, beaten president Yahya Jammeh of The Gambia promised to challenge the results of elections that he had previously accepted. Elsewhere on the continent, there are numerous examples of leaders wanting to amend the constitution to ensure more years in power. Buhari and other African leaders will meet for talks after the inauguration to discuss the crisis in The Gambia caused by Jammeh’s refusal to step down. Akufo-Addo has vowed to put Ghana “back on the path of progress and prosperity” after an economic slump under Mahama that led to an International Monetary Fund bail-out. This week Mahama defended his record, saying his government had been up against “strong headwinds” that caused growth to slow, public sector debt to rise and the cedi currency to fall. But the 58-year-old encouraged Ghanaians to get behind Akufo-Addo and on Wednesday showed his successor round the seat of government, Flagstaff House, in Accra.